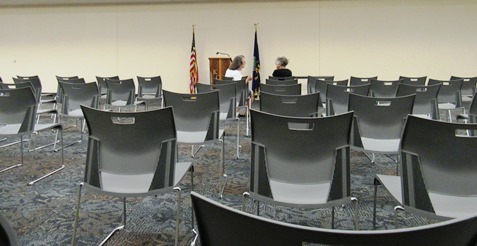 Empty seats greet Kobach in Wyandotte County – Welcome to Wyandotte Daily! The Kobach for Governor Victory Tour came to Kansas City, Kansas, on Thursday afternoon, but there were just empty seats greeting the candidate. As Kris Kobach, a Republican candidate for governor, made a tour of several cities on Thursday, he came from a group of about 30 supporters in Leavenworth, to none in Wyandotte County. Kobach and incumbent Gov. Jeff Colyer are the frontrunners in the GOP campaign for governor, with the primary election on Aug. 7. 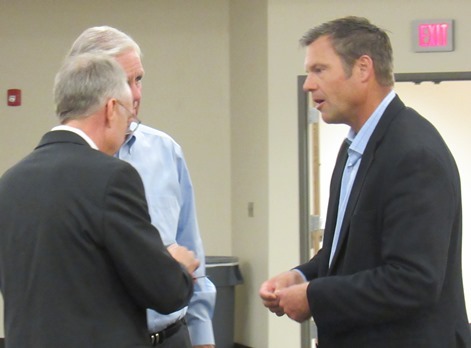 Kobach stopped at the Dr. Burke KCKCC-TEC Center at 6565 State Ave., interviewed a short while with two journalists, met with the college president, then went to his next stop in Johnson County, which was expected to have a much bigger audience. Other stops had 40 to 50 persons attending, according to a Kobach staff member. Two women had driven over from Johnson County to hear Kobach speak in Wyandotte County, but they left before he got there, as his tour was delayed, and they said they had to go to an appointment. While here, Kobach commented on the Kansas City Star’s story today (www.kansascity.com/news/politics-government/article215374130.html) about his work as an attorney representing small towns in immigration cases. He said the article “was a good example of fake news,” and rebutted several points in the story. He said every case he handled involved a town that had already passed an immigration ordinance and then asked him to defend it. In addition, he said all the cities did not lose in court; two won and two lost. Also, he said another error is that ordinances are not being enforced in two cities that won in court, but the ordinances are being enforced. Another theme of the article was that he gained vast wealth by representing the cities, he said. However, he said averaging it out over a period of years, it was less than $50,000 a year. Kobach also criticized the involvement in the article of ProPublica, which he claimed was left-leaning. On another topic, the ACLU today sent out a news release saying that taxpayers will have to pay about $26,000 in attorney’s fees to the ACLU and in expenses on a contempt charge against Kobach from federal court. The case was in connection to the state’s proof-of-citizenship law for voter registration. “Tens of thousands of innocent Kansas voters lost their right to vote because of Sec. 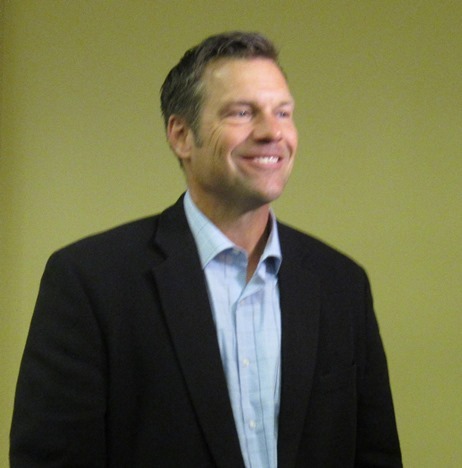 Kobach’s policies,” an ACLU official stated in the news release today. The law was struck down, and Kobach faced a contempt charge. Kobach said the court has ruled the defendant is the state of Kansas, and when the state is sued, the official doesn’t pay the fees himself. Colyer has sent out a news release saying that Kobach shouldn’t use the state’s funds to pay the fees. “The other thing Colyer doesn’t seem to understand, is that the specific thing the judge is looking at that was the basis of the citation, is the failure of certain counties to send out notices to voters who were covered by the voter injunction,” Kobach said. Voters all received one notice, but the judge wanted them to receive two notices, he said. “My office instructed the counties to do so,” he said, but the counties had a lot going on in the weeks preceding the election, and some counties didn’t send out the notice. “If the counties aren’t able to follow the instruction, that isn’t the fault of the secretary of state’s office,” Kobach said. He also said they are planning to appeal the ruling. If there is a penalty to be paid to the ACLU, the state would pay it, he added. Kobach said his two last-minute messages are about taxes and illegal immigration, his top issues. Other candidates won’t even sign a no-tax pledge, he said. He said his first executive order would be to require all state agencies to use the E-Verify system to make sure all state workers are here legally. The second thing he would do is to ask the Legislature to pass along the federal tax windfall to the taxpayers, he said. The bill came five votes short in the 2017 session, and he will ask the Legislature to bring it to his desk within a month of taking office. Kobach said his latest poll shows him ahead by 9 percent over Colyer. He was confident that he could defeat any of the Democrats that will be elected, and he viewed them as all on the left. If Greg Orman succeeds in collecting enough signatures to be placed on the general election ballot, Kobach said it would be two liberals running against Kobach, a conservative. It would probably help Kobach, but not necessarily, he said. More blaming others for his hateful behavior. He is a narrow minded, negative, un-american, manipulative entity who needs to be voted out! Vote Blue & let’s get back to what America is really all about! Did anyone know he was coming? Where was it advertised? The College was not even in session then. Thanks very much for your comment. You make some good points. Didn’t notice any paid ads for it. A note was posted on a Facebook page for a GOP organization (https://www.facebook.com/WyCoRepublicanWomen/) the day before the event. On the morning of the event, the schedule of the stop was broadcast on a TV station. A journalist from a TV station was there and did an interview with him on camera. It a shame the word did not go out! Go red!